Traveling is basically what I do for a living so it’s super important for me to have the best carry-on luggage when I’m moving around. The perfect international carry on luggage has to be comfortable enough to take around the airport on long layovers. It must be easy to transfer and has to fit all of the things I need to bring on the plane with me. Who wants to lug a duffel around the airport when a spinner carry on makes portage so much easier? 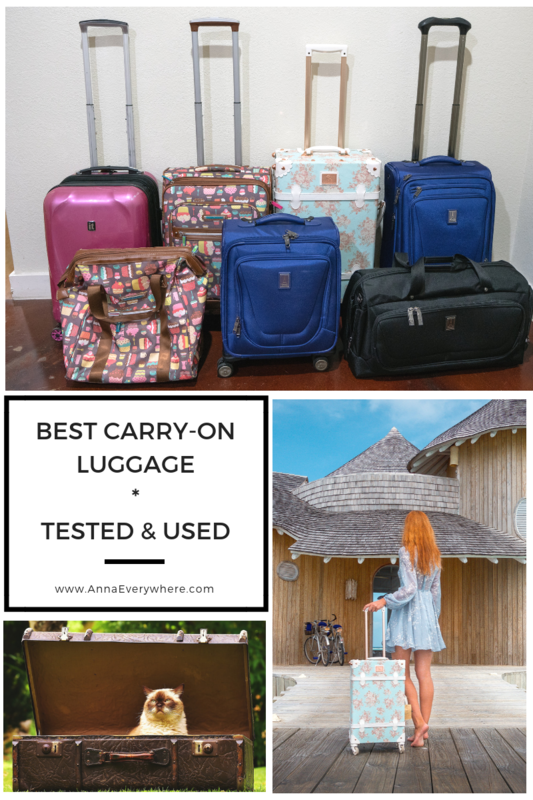 I’ve broken down everything you need to know in order to find the best carry-on suitcase for your travels, as well as a list of different luggage that I would recommend, one of which I have no doubt will be exactly what you’ve been looking for. Why you should trust me? Unlike some popular websites or travel blogs doing compilations of best suitcases without actually testing them, I’ve used and owned all these suitcases I mentioned. Which Carry-On Luggage Is Best For You? Scroll down for full descriptions of each piece. What is the Best Carry On Luggage Size? The recommended size for carry-on suitcase to fit into the overhead lockers in most aircrafts is 22 inches x 14 inches x 9 inches (56 cm x 35 cm x 22 cm). So anything this size or smaller will fit depending on how much you need to bring on board with you. Most airlines let you bring a larger carry-on bag, as well as a smaller handbag. However, it will depend entirely on what you have to take with you on the plane. What should you look for when picking your next carry-on bag? Should you pick a suitcase or a backpack? Here are a few things to consider when purchasing your next travel companion. Luggage with four wheels tends to be easier to maneuver and roll around since their wheels tend to spin on a 360 spinner. This, however, means that they sometimes don’t roll as well on rougher surfaces like cobblestones, as the way two-wheelers do. You’ll have to take your destination into consideration when picking which carry-on luggage is best for you. Four wheelers are also more suited if you have more than one suitcase. You can rest them all on the ground while pushing them, whereas you would have to be balancing the two-wheeler downwards while you’re rolling them. Obviously, everyone wants to get the lightest carry on suitcase. The size and weight of your carry on luggage will depend on how much you’re taking with you on the plane, and how much you can comfortably carry around physically. Your luggage including everything inside has to be easy for you to lift and put in an overhead bin, especially if you’re traveling solo. Some luggage has an extra zipper that allows them to expand if you need a bit more space. 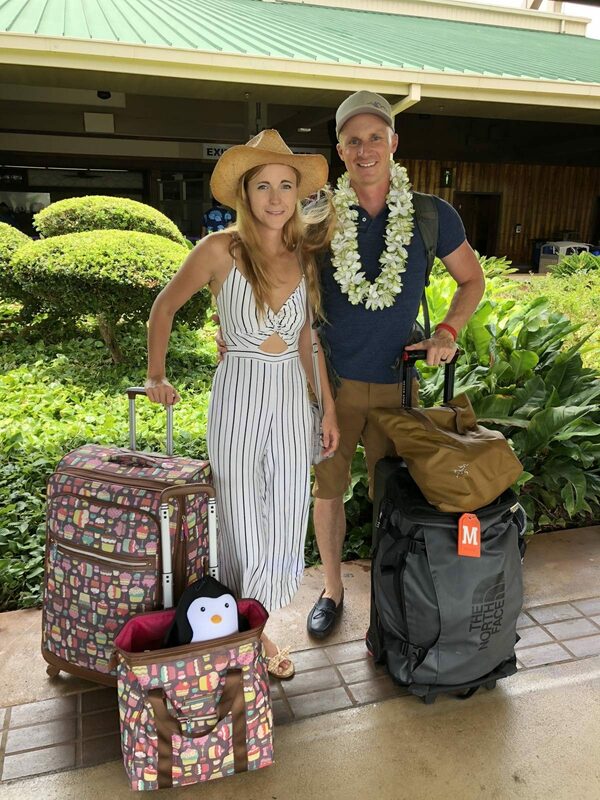 This may be something you want to look for if sometimes you travel with fewer items and at times, maybe for long-haul flights, you have a bit more you want to bring on board with you. You probably have a number of different things you want to take with you on a flight (especially a longer journey), like a change of clothes, a book, your toiletries, your laptop, chargers and maybe even some snacks. If you have more things, then you might want to have a few interior compartments. They let you organize everything better and access exactly what you need without fumbling around in your bags in the middle of a flight. If prefer to have everything in one place, in which case there are some options with a single large compartment too. Sometimes you may find that luggage with soft cases may not protect what you’ve got inside them as well as hard cases, especially if other people are putting things on top of them. This will depend on whether you’re carrying something fragile like maybe your camera or souvenirs too fragile to put in your check-in bags. 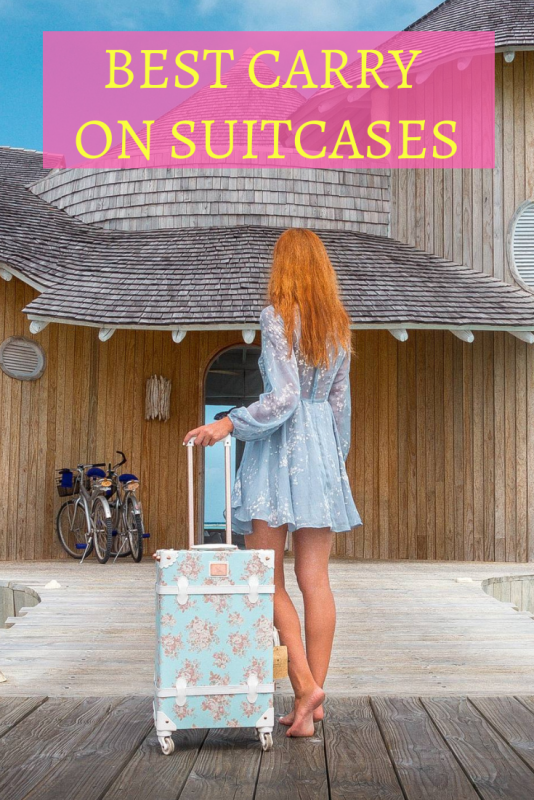 Alternatively, you may also decide that a soft case suitcase is more durable than a hard case because it isn’t as easily bent or scratched during the bustle of moving around the airport or around in transport. This is entirely up to your preference and your needs. If you’re traveling as a family or with more than one person you may want to have more than one carry one luggage to fit everyone items. Most airlines don’t allow more than on larger carry-on per person unless you pay a little extra though. A sturdy carry-on bag with an external USB port and many compartments, used by cabin crew and pilots for many years. I’ve been using this bag for quite a while now and so far it didn’t fail me. It’s a very durable bag and the wheels work just as good as when I used them for the first time. When I overpacked the front pocket the bag didn’t fit in an overhead compartment of the smallest domestic planes, but you don’t have to stuff the front pocket too much. Lightweight scratch resistant hard suitcase with built-in TSA locks, that will last you for a long time. I got this carry on bag as I trust Samsonite and my parents have been using their luggage for many years. The suitcase didn’t disappoint. It’s extremely lightweight, so in case an airline weights your luggage (Norwegian does for example) you’ll be fine. I was slightly annoyed by the lack of side handle to carry the suitcase or pull out easier from the overhead compartment. The bag survived being sat on, so it’s definitely sturdy enough not to break easily. A beautiful small piece of luggage for a stylish traveler. When I first saw this suitcase online I knew I must get it. The design is absolutely beautiful (they have them in different variations). I’ve never had a bag that everyone was asking about so many times – flight attendants, random people at the airport, everyone wanted to know where is it from. I was even allowed this bag on board when overheard compartments were full because the flight attendants thought it was too cute to check. Because of the waterproof material, the bag isn’t getting dirty and you can clean is very easy. I matched the suitcase with a separate cosmetic case that you can put on top of the suitcase. Most popular suitcase among luggage reviewers. When I first discovered this bag I thought ‘this is too ridiculously expensive’ and frankly it is. But, I was quickly turned as this bag is definitely worth the price if you’re a frequent traveler. The handle is very high and sturdy, so if you’re tall you don’t need to bend over to reach it. Super convenient luggage for a business traveler. The front compartment gives a quick and easy access to a laptop and other electronics, without having to open an entire suitcase. I personally hate keeping everything in one compartment, so another zipped inside part could be used to keep shoes separate or dirty things isolated. The bag can be comfortably rolled on uneven surfaces and cobblestone streets. This luggage is small enough to fit in the overhead bin, but also secure and sturdy if I chose to gate check my suitcase. Roomy lightweight luggage that can come in bright colors, easy to distinguish from other suitcases. American Tourister has been producing luggage for years and can be trusted. While this piece is listed as 21 inches high, it’s actually 24 with spinner wheels that do take up space. However, I’ve never had any issues fitting it in. The inside is very roomy, so you can pack a lot of things without your bag being overstuffed. Fantastic bag for those who can’t stand for long period of times, as it can be sat on or used as a table for a laptop. While it might seem too pricey to some, Zuca is an awesome modern gear. It opens like a locker and includes smaller zipper pouches that can be stacked inside. It feels a bit unstable when rolled over any bumps, but the wheels hold on. It’s not the most spacious bag in the world, but with their packing cubes, their shelf system works well enough. Extremely lightweight and affordable set of fashionable suitcases. I got these suitcases as I needed some cheap pieces for moving and have been using them ever since. Zippers never got stuck and each suitcase holds perfectly even when expanded. I’ve never had a single issue with wheels, even if I packed 60 lbs into the biggest one. The case is also super resistant both to bumps and scratches, my clothes were fine inside even during the rain. Lightweight and affordable set of suitcases that can last you for a long time and turn heads at the airport. When looking for my ideal set of suitcases I wanted to have a piece that wouldn’t look like everyone else’s suitcase at the airport. So far, I haven’t seen another person with the same design what makes things easy at luggage conveyor, hotel storages, or explaining to luggage porters which one is your set. You know immediately if your stuff is there. Lily Bloom also offers 4-piece sets in even cuter patterns, so check them out as well. When it comes to their carry-ons, the smaller piece fits easily under the seat and middle-sized piece fits in the overhead compartment. With packing cubes, all of your stuff can be separated accordingly. You’ll be sure your clothes stay exactly where they need to be and won’t wrinkle. You can also use them to separate your clean clothes from dirty ones. They’re very handy as they save space. You don’t want to repack your liquids every time you go through a security check. This is why it’s handy to have a transparent cosmetic bag, so you can just put it in your tray without having to move your liquids. Laptop case is always handy since your computer can easily fall off from your luggage. It simply adds an extra layer of protection. I never have to remove my laptop from my case when going through security. Stow-N-Go is an alternative to packing cubes. It helps you pack your bag, just hang our expandable system, load your clothes, collapse and latch the system and pack in your suitcase. A plane pillow is another handy carry-on item that you can bring on board without having to stuff it in your suitcase. I have a penguin-shaped one personally (click on a link above to see it). I definitely need to update my luggage, they don’t have the spinning wheels & gets to be a hassle when dragging them around! Spinning wheels are so helpful! never own a luggage before so this is a great information! The inside of the vintage floral suitcase seems so useful – it would definitely make my packing easier! Thanks for this post! I’ve veen looking for a new luggage for quite a while now and then I see this post. I absolutely love your style and that reflects in your choices of luggage as well. I especially love the vintage one😊 Thanks for the informative post, I’m always look forward to them. Great information. I’m in the market for an upgrade to 4 wheels. Thanks! We definitely need to upgrade our luggage. I like how you broke down the pros and cons of each of these, making us stop and consider what’s important to us. Great detailed information plus an honest opinion of each. I love to travel and find as I get older that function over fashion is becoming more important. I think I like the Briggs & Riley best but agree about the price. Thanks for the useful information. I can’t wait to go luggage shopping for my trip to Amsterdam! Thanks for sharing this post regarding Bag pack. I have a long day plan for Morocco Sahara tour. I have already booked my trip with the help of a locally-run travel agency Sahara Bliss. I had just confused that what will I pack in my bag. But after your post, I am really feeling free with this tension.